Dartmouth ought to have more interdisciplinary classes. When thinking about where to go for college, I was drawn to America because of the much-vaunted liberal arts education. I did not know what I wanted to study, so a school like Dartmouth seemed a natural choice. Three and a half years later, I’ve learned a little about a lot of things and wish I knew more about connections between fields of knowledge. 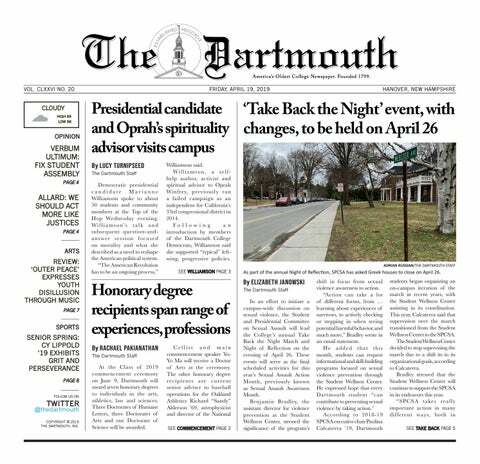 When Dartmouth speaks of improving its offerings, it is simply announcing its intent to add more choice. This is not necessarily a bad thing. The emphasis on experiential learning has allowed economics and public policy students to travel abroad as part of their classes. But we should also enrich the offerings at Dartmouth to provide a liberal arts education in line with changes to society. The sacred liberal arts education is not monolithic. Since antiquity, its aim has been to provide students with the skills necessary to participate in civil society. Those needs have naturally changed over time. In our current world, we need a greater emphasis on interdisciplinary studies. Academics mention the importance of interdisciplinary studies, but they are almost exclusively limited to the humanities. What’s more, fields like English and history are focused on demonstrating how other areas of knowledge contribute to their own concentration. The only inherently interdisciplinary majors at Dartmouth — in the sense that they contextualize a topic or area of study via existing fields of knowledge like economics, English, geography or history — consist of African-American studies, environmental studies, Latin American and Caribbean studies, Native American studies and women and gender studies. These majors ostensibly emerged out of calls to balance power dynamics in academia that play out in society. These programs have made valuable contributions toward balancing historical narratives, nuancing and diversifying courses and complicating how we define fields of knowledge. But their influence on the intellectual experience of Dartmouth’s students is highly selective. Many undergraduates go through Dartmouth not having taken a course that emphasizes interdisciplinary work; the closest they come is checking the box for various distributive requirements before graduation. This leaves the influence of these programs and the potential of interdisciplinary study diminished. Some would argue that because these majors are themselves inherently interdisciplinary, there is no need to further extend the trend. But the elephant in the room is that majors representing the nexus of power structures in American society today — such as economics — are largely untouched by the influence of interdisciplinary studies. While there are already classes in each department that emphasize aspects of other fields of study, the absence of more cross-listed courses that explicitly engage with other departments speaks to a failure of interdisciplinary study at Dartmouth. For example, most economics classes do not seriously focus on the role of racial and environmental exploitation in capitalist systems, and while African and African-American studies and environmental studies majors are well aware of these forces, they may lack economics majors’ understanding of, say, the fundamental principles behind free markets. Consider the potential behind a course cross-listed between economics and environmental studies. I am not particularly invested in either of these fields of knowledge, but I notice that on Dartmouth’s campus these students speak vastly different languages. Some environmental studies majors will denounce burning fossil fuels while some economics majors will point out how unattainable such a goal is for the American economy. So environmental studies majors can denounce the evils of capitalism and economics majors may laugh off the idealism of their greener counterparts. This leads to a sort of deadlock, in which neither field of study actually engages with what the other is saying. Students learn the maxims of their major and go into the world believing they possess the ultimate narrative on how the world works, or doesn’t work. What if there was a class that explored the intersection of these two fields from both majors’ perspectives? Instead of having a class solely on Greenpeace and a class focused on Goldman, there could be a class with content that covers the space in between. I am not calling for an end to the separation of majors. Subject areas exist for a reason. The skills required to study English and computer science are different. But disparate fields of knowledge can and should benefit from more interdepartmental classes. At the moment, there is little interest in developing original, perhaps idiosyncratic, courses that bridge the silos in which we have demarcated knowledge. Granted, these courses would be nightmares to assess and would be difficult for individual professors to teach. But the challenge they pose is matched by the intellectual reward they could yield. Instead of simply having the humanities cross-pollinate each other into oblivion, we could have more courses that challenge students’ world-view, provoke dialogue and mutually enrich fields of knowledge.